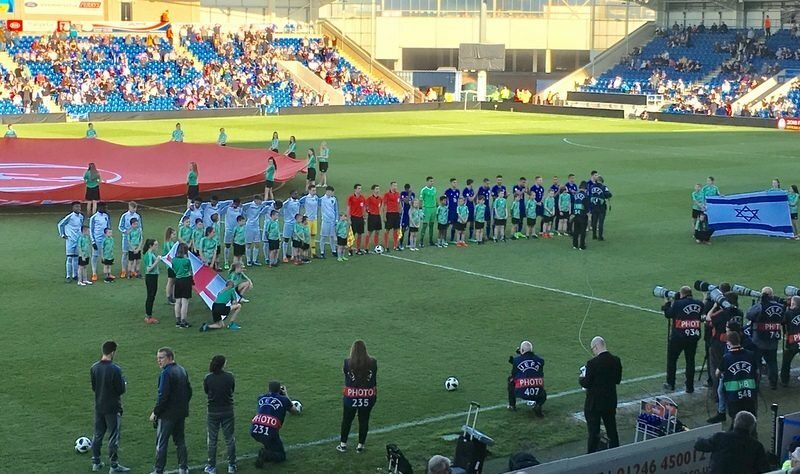 England began their 2018 UEFA European Under-17 Championship campaign with a convincing victory against Israel at the Proact Stadium in Chesterfield. Steven Cooper’s men deservedly took take all three points in their first fixture of the campaign with an eye-catching second-half performance. Although the Young Lions failed to capitalise on a few misplaced passes in the early stages, they started the game brightly and continued to press from the off. A couple of early opportunities came their way from either wing, however, Israeli goalkeeper Shareef Keouf managed to save comfortably by intercepting the crosses on both occasions. Israel had begun to slowly settle into the game, Omri Ram whipped in a cross from the right in the first ten minutes, but the ball ran past everybody in the box as Israel’s first opportunity went begging. Central midfielder James Garner often found himself in the heart of England’s attacks, and after 23 minutes, a direct run by the youngster saw him dance through the centre of the park and square a pass to Buyako Saka on the right, who drilled his shot wide. It was Saka who was involved once again when England’s breakthrough came in the 29th minute. He skilfully skipped past his man and was consequently brought down in the area. England’s No.8, Thomas Doyle, stepped up and neatly placed his shot to the left-hand side of Keouf in goal. England deservedly took a one-nil lead after persisting for a short while. A short period after, suddenly, out of nowhere, Israel attacked down the right and Ofek Ovadia let fly from the edge of the box. The ball seemed to loop over goalkeeper Luca Ashby-Hammond, who was left stranded. Fortunately for England, the ball bounced back off the bar. This was a warning and a huge let off for the hosts. 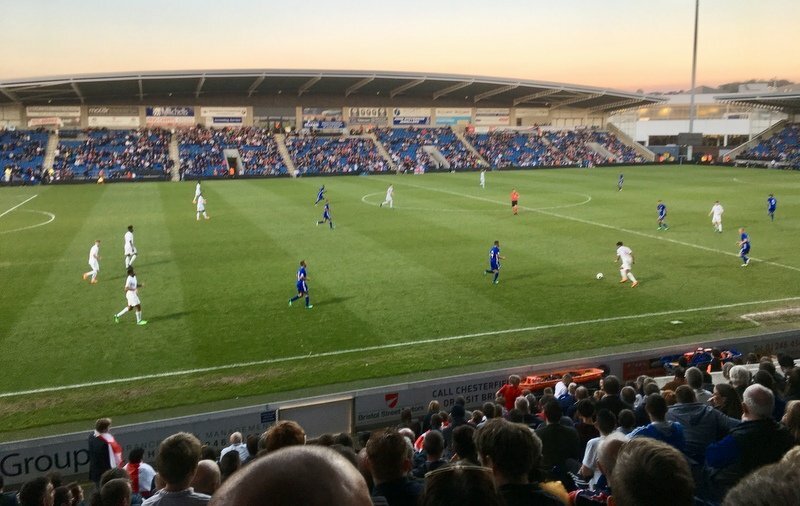 With only a minute remaining in the first-half, Israel forced themselves forward, and this resulted in England centre-back Ethan Laird making a clumsy challenge in the area. The referee quickly pointed to the spot. Israeli centre-half Dan Lugassy consequently stepped-up and struck the penalty sweetly with his left peg to the right, giving Ashby-Hammond no chance between the sticks. The referee blew for half-time seconds afterwards. One-a-piece at the break was a fair reflection of the game as both teams headed down the tunnel. As both sides returned for the second-half, Israel kicked off and it was a scrappy first five minutes of the half. Although England were creating the best chances, Israel continued to look dangerous despite not having any clear-cut opportunities. The Lions had begun to pile on the pressure even more so, Tyreece John-Jules and Garner both hit efforts wide of Keouf’s post on separate occasions as England searched for a second. England finally hit the net and their second goal of the evening. After some great combination play on the right by Amaechi and Daley-Campbell, Matthew Daly slotted home from eight-yards to put England 2-1 ahead. Consistent pressure had finally paid off and only 23 minutes of the contest now remained. Israel struggled at all to get going in the second-half and failed to have a shot at goal. The hosts dominated play and the result now seemed inevitable as the ball remained in Israel’s half for the majority of the second period. With six minutes of added time to play, England had a long-range effort saved by Keouf, with the goal gaping, the rebound was fired over and the referee blew his whistle shortly after. 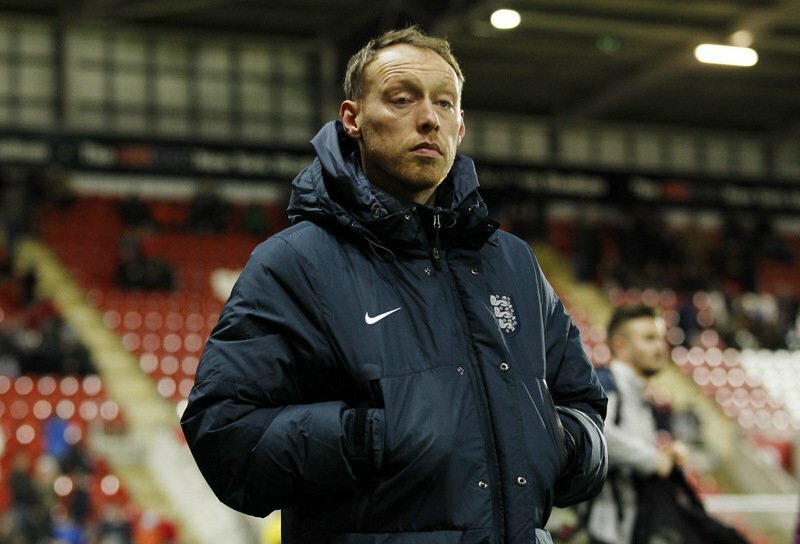 England U17 Head Coach Steve Cooper. England ran out convincing winners in the end and it was smiles all around in the home nation’s camp. Cooper’s Young Lions next face Italy on Monday, May 7, where they now have the opportunity to top Group A.